Quite often I have matcha tea in the afternoon. It goes perfectly well with sweets (so it feeds my sweet cravings) and it also replenishes my energy levels and makes me alert and focused. And if I have a matcha sweet with my matcha tea, it's a double pleasure for me. 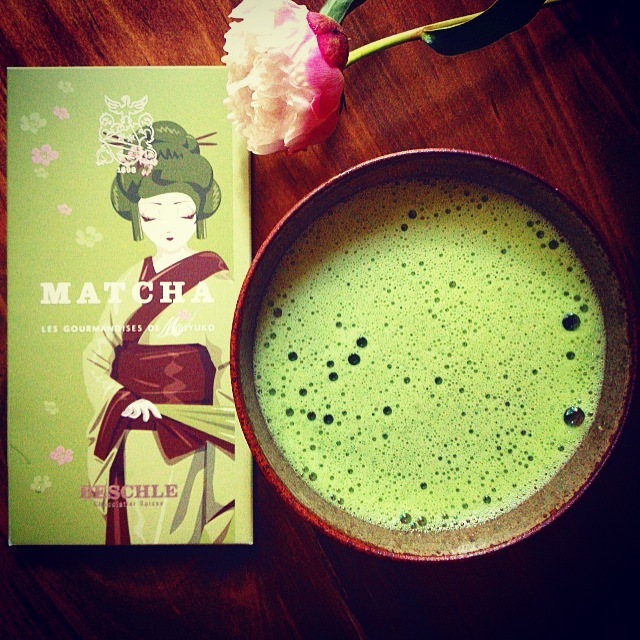 I first saw this particular french Matcha chocolate in Fortnum & Masons and it was almost £7 there. "Too expensive!!!!" - I thought to myself, yet, I really liked the feel and design of the chocolate and wanted to taste it too! After all, it was made with match tea, and I had to try it! So I found the same one in Japan Centre for almost half the price, and of course, I bought it. It's a perfect colour combination - both tea and chocolate so green and vibrant. And the taste is amazing too. Matcha and chocolate is the match made in heaven!